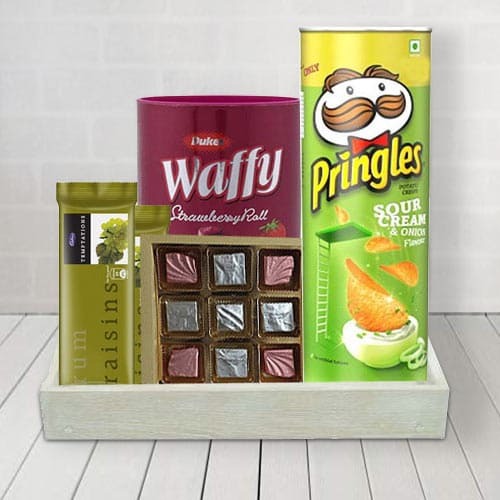 A fabulous gift for all occasions, this Chocolaty Treat Gift Basket for him spreads love and happiness with its beauty and style. This Gift Basket is filled with sweet treats that convey your holiday cheer like Handmade Chocolate Box (9 pcs), 2 Cadbury Temptations Rum n Raisins, Dukes Chocolate Rolls and Pringle Chips. These entire items are loaded carefully in a Wooden Tray.